Successfully Added Gadget Paper Shredder + Letter Opener - USB Powered to your Shopping Cart. Gadget paper shredder and letter opener combo powered directly by a computer via a USB Port. This desktop accessory comes with a plastic container, catching all the shredded paper, and keeping your workplace clean of unwanted debris. This model comes in a perfect size and shape and nicely sits on your desk, making it look extra cool. This is the perfect device to ensure your confidential letters are securely disposed of when needed. Its size and letter opening function gives it that additional usefulness. Opening letters has never been more fun and easier. Have you ever accidentally torn of a piece of the letter within an envelope? Well, just like many of us, this is the solution to your problem! With a simple slide, you can open your envelope efficiently and safely with out destroying the letter within. This is certainly a must have item for any home study or office. This portable paper shredder and letter opener is perfect for students, teachers, office workers and secretaries. This item is available in stock now, so get a few of these, keep on for your self, give the rest as gifts or sell them to pay for the entire cost of your purchase. The CVECZ-PS1001 is available to you for single or bulk purchases straight from the leader of factory direct wholesale electronics, Chinavasion. Lip size: 125mm - For paper wider than 125mm, simply fold the paper in half. If the paper is no more than 125mm long you can put two in at the same time. 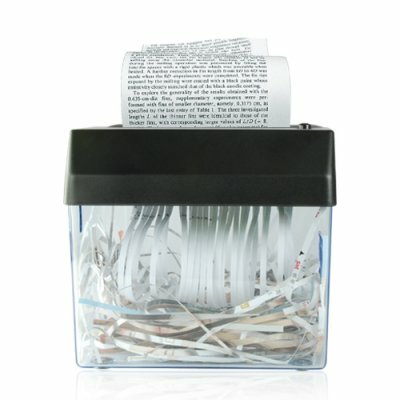 After shredding paper, how thick will the shredded paper be in millimeters (mm)? For additional security and making it extremely and imposable to put back the original document together, the thickness of the shredder piece of paper will be 4 (mm). Will this unit work on MAC computers? Yes, the USB is only for power so this unit will work with any Windows, MAC or Linux computer. I like this Gadged, I could destroy two paper at the seam time, I tested it with Batteries, Thanks!